Preparing to shoot in your first organized tournament? Here are a few handy tips, tricks, tasks, and trade secrets to help you through your first tournament. Pack the night before. Check to make sure you have everything you need. Bring “extras” just in case. Not everyone can afford to have a second bow set up identically to the first, or a second compound release. But you can carry backups of less expensive items – arrows, points (for screw-in tips), nocks, finger tabs, arm guards, pressure buttons, rest blades, clicker wires. If you’re outside, bring a hat, sunscreen, and bug spray. If you normally shoot in sunglasses, don’t forget to bring them! If inclement weather is in the forecast, bring suitable clothing, an umbrella, and the like. Bring extra snacks and drinks, especially water. Most tournaments last a minimum of 2-3 hours, so keep yourself fueled and hydrated. If the venue allows it, bring a comfortable portable chair with your name on it. Bring at least two pens and two pencils. Arrive early! Most tournament directors ask archers to come one hour early to facilitate sign-in, lane assignments, and equipment inspections. By arriving early, you give yourself plenty of time to prepare your equipment and yourself. 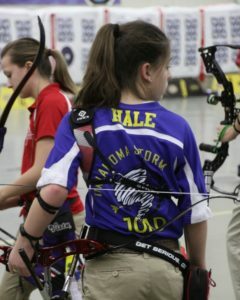 Understand the equipment rules, especially if there will be an equipment inspection (the norm for USA Archery tournaments). Know and understand the rules for your competition – your target face, how it’s scored, how many arrows per end, how many ends. Pay attention during the briefing from the shooting director or judge. You may know the rules and procedures frontwards and backwards, but last-minute changes can occur. Turn your cell phone off – don’t just use the silence or vibrate setting – turn it completely off. You don’t want a distracting buzz-buzz-buzz while at full draw… and that buzzing is louder than you think! 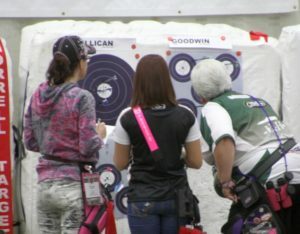 When shooting, follow your normal procedures and shoot as you have trained. Now is not the time to “try something new”, or worse, to imitate something you see another archer doing. Save experimentation for the practice sessions! Know proper line procedures for your tournament. Most ranges use whistle or horn blasts – two to the line, one to shoot, three to score and retrieve, and five or more for emergency. Some tournaments may supplement with special verbal commands. When walking up to score the arrows, do not touch the arrow or the target face until all arrows have been scored. Be careful – violating this rule could result in warnings, reduction of score, or disqualification. Understand the scoring procedure. Most tournaments will have two scorecards per archer, with four people scoring together. Two archers will each record scores for all four archers; the third archer will call out the arrow values for each archer; and the fourth archer will verify the values and scores are correctly recorded. Know the procedures for alerting the judge to a medical or mechanical problem. In most tournaments, this involves stepping off the line and raising your hand. If you and the other archers on your bale cannot agree on the value of an arrow, call the judge to rule on the arrow. The judge’s decision is final. With all of these rules, procedures, and tips, it’s easy to forget one of the most important rules of any tournament, especially your first one: HAVE FUN. Although tournaments can be stressful, they’re also unique and don’t happen very often. Celebrate the fact that you have worked so hard just to be there at all. Enjoy every moment. When you make a mistake (and you will!) don’t dwell on it, but do remember it for your next tournament! Archers should be graceful in their movements, and gracious in their moments of victory or defeat. If you lose, do so with dignity and with sincere congratulations for the winners. And if you win, be even more dignified and gracious! For those of your with tournament experience, please feel free to share your own tips in the comments section! One thing that occurred to me as I was reading this- be aware if the tournament you’re shooting in has a dress code. 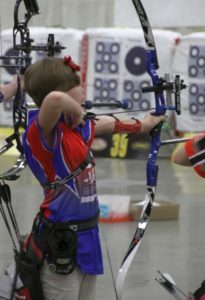 Many NFAA shoots do not, but most USA Archery competitions DO. It can happen that if you wear camouflage or blue jeans to a shoot where such are not allowed you could actually be barred from competing. Don’t let your tournament experience get shot down because you didn’t pay attention to the rules!